The birthday and new baby cards at work are getting out of control. I work in an office of over 50 people and it seems like I am getting some kind of card to sign at least twice a week now. Often times the card is for a person who, I am ashamed to admit, I barely know and would not be able to pick out in a line up. I know I am not alone in my frustration. The worst thing about signing these cards is trying to find the next person to pass them off to. Everyone hates the incessant card signing. Last month one of the attorneys saw me walking toward him, new baby card in hand, and he purposely ducked around a corner to avoid me. I broke to a run and chased him down. Poor sweet Diana stammered, “I’m so sorry. I didn’t know.” She then dashed off, in tears I think. I love being a cranky old lady. Mrs. B crawled under the futon at 9am this morning and she has been there ever since. 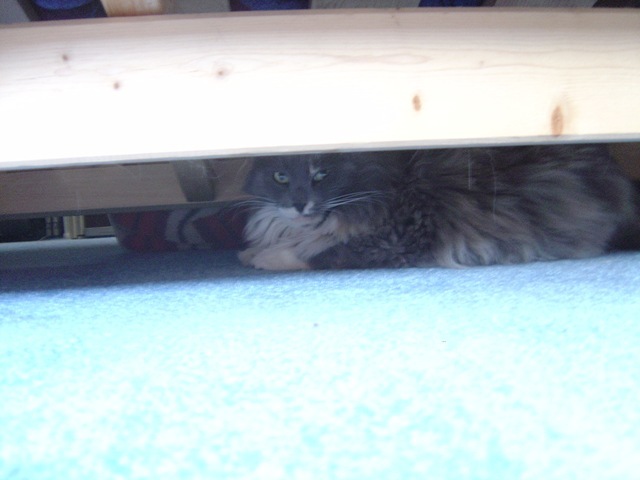 She discovered this spot as a good hiding place a few years ago but seems to be spending a lot more time there lately. I think she’s freaked out because I’ve been running the vacuum cleaner a lot more lately. Like all cats, the vacuum cleaner is Mrs. B’s natural enemy. She is convinced she is it’s prey. The ironic thing is Mrs. B is the reason for my increase vacuum usage as of late, what with her constant hair shedding, compulsive nail scratching and bringing in debris from outside. Jerry is also a bit frightened as well as mystified by supplemental vacuuming. Seeing me at an activity other than reading or watching TV, much less something domestic, makes him wonder if there’s something wrong. If I keep this up he just might suggest I fire my maids. Yikes! 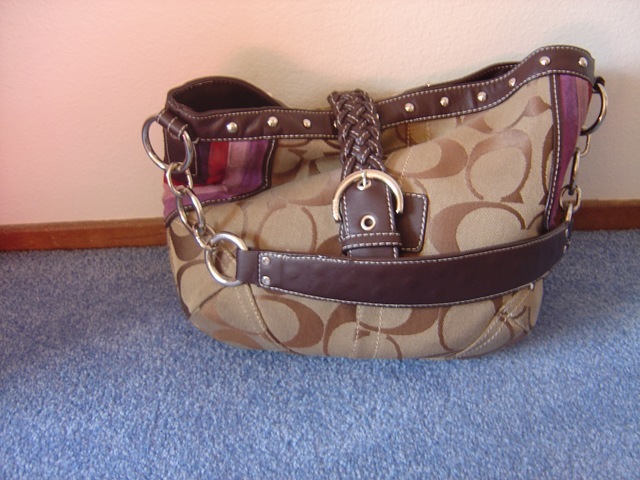 I don’t care that it’s Coach. Frustration has been building for months and I am now ready to declare this the worst purse I’ve ever had. And apologies in advance to my sweet sister-in-law who gave it to me. Honestly, when I first received this purse a few years ago as a Christmas gift I was thrilled. 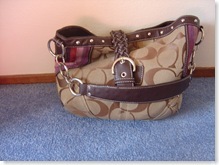 I had always wanted a Coach bag and this one was especially beautiful. So rest assured Mia, my shrieks of delight were sincere. As was my efforts to use this purse. Since I already had a functional purse I reserved this one for special occasions. I felt so stylish and expensive when I used it I didn’t even mind the jangley noise the chains made. Then, six months ago when my old purse finally gave out I decided to promote this one to a full-time position. It’s been misery ever since. In addition to finally getting on my nerves every time I’m in a moving car, the jangley chains have also proven themselves to be rather heavy. Tuck in a paperback book to and this purse feels like it’s 50 pounds. Having no side pockets or compartments makes it a bottomless pit. That is until I have to reach inside and then everything falls out. Add that it constantly slips off my shoulder and I’m ready to catapult this thing into a dumpster. And I will, as soon as I find a replacement.